A happy horse. A frightened horse. An angry horse. A bored horse. A grieving horse. A frustrated horse. A horse horse in pain. A playful horse. A proud horse. An eagerly competitive horse. And many horses more! 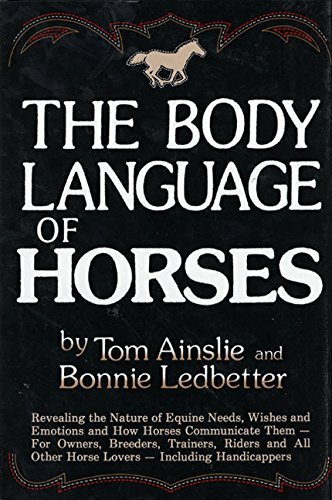 Moreover, you will know how to reassure the frightened, calm the angry, comfort the grieving, divert the bored -- and deal with most other human-equine difficulites. You will know how to educate a foal or rehabilitate a rogue. You will know how to look at race horses on their way to the starting gate and differentiate the likely winners from the losers. You even will know how to buy a horse. But best of all, you will finally understand what these grand animals are all about, and you will know better than ever before how they (and we) fit into nature's scheme of things. If you have any questions about this product by Brand: William Morrow n Company, contact us by completing and submitting the form below. If you are looking for a specif part number, please include it with your message.